With this album Nikolaj Hess opens up a new chapter in his career. Among the many albums piano player Hess has taken part in, American musicians have been important guests. This time Hess has teamed up with two of the most trendsetting and sought after musicians in American jazz (and the fields around it) within the last ten years. Bass player Tony Scherr and drummer Kenny Wollesen are both permanent members of Bill Frisell’s Trio. Here they have created a series of genre defined albums which will last for years to come. 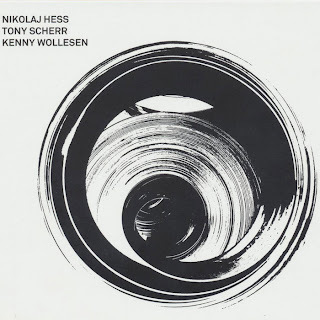 Wollesen is also a permanent member with avant-garde-man John Zorn while Tony Scherr is a very sought after sessions musician – with both Norah Jones and Rufus Wainwright on his bill. When Hess is playing with musicians this strong my expectations are high – but they are all met! Nikolaj Hess has created a trio-album which bursts with melodic energy. Hess’ alternating piano playing is both sweet and salt. He plays two compositions by Bob Dylan. To Make You Feel My Love (from the ’97 classic album Time Out of Mind) and Masters of War. He also does a version of Ellington’s Cottontail. The rest is composed by Hess. He has an ability to let the music flow in a very natural way. Tunes like Sept 10 and Film have been favorites of mine since I head the album for the first time. Trio is an album you should buy if you have a weakness for melodic trio-jazz with weight and volume. BONUSINFO: Tony Scherr is recording with another Dane this April, as guitarist Aske Jacoby is traveling to Los Angeles to record a trio album where Jim Keltner will play the drums.